Beth Lawrence’s mixed metal necklace features two hand-formed hammered hearts layered together. Silver and gold complement each other. They each stand out as bright, beautiful individuals, but together they really shine. (Hey, this is starting to sound like a metaphor for a relationship!) 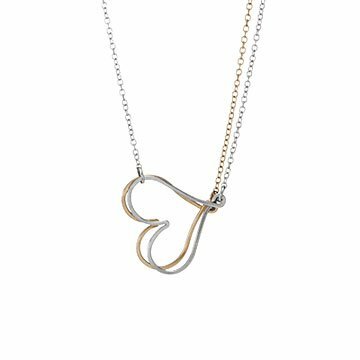 Two hand-formed hammered hearts—one silver and one gold—come together in Beth Lawrence's mixed metal necklace. Each heart slides independently along the double chain if you move them, but they layer together when worn. It's a sweet gift for a newly engaged bride-to-be, your own someone special, or even a best friend or close family member. Handmade in Nashville, Tennessee. Nashville artist Beth Lawrence can't remember a time she hasn't made jewelry—she even sold her work to neighbors and boutiques while still in elementary school. After earning her degree in studio art, she worked at galleries throughout Atlanta and Nashville before rekindling her passion for creating jewelry. Drawing inspiration from geometry, she makes her pieces with "love and a hammer," using sterling silver and gold-filled wire to form accessories that are simple and delicate. Pendant: 1" x 1" Chain: 16"
Bought this necklace for myself because I thought it was so cute. It's just as adorable in person. Extremely versatile - I wear it to work, going out, etc.